There’s no denying that playing live is fun. In fact no buzz, that I’ve ever experienced, comes close. However, it’s a lot easier to gig when you’re young. This has nothing to do with your arthritis, or getting out-of-breath, or your unaccountable need for eight hours sleep a night in a proper bed; it’s because organising the damn thing as grown-ups is so much more difficult than it was when you were all kids. The hell-raising guitarist is now a paterfamilias with several children, the wild-child chick singer is now the CEO of an international company, and however keen you all are to strut your stuff and show the youngsters how it should be done, time has now become a serious issue. Personal Organisers must be flourished at each other before a window-to-rock can be found. And money now becomes a major consideration. You used to be able to rehearse for nothing in the student flat or the squat; now you have to rent a rehearsal room, and as for the ones in the band who kept the faith, and made music their profession, well, professional musicians seldom make much money, and if they’re going to play for you, they really ought to be paid. In my own case, these factors started to kick in twenty-five years ago. I virtually stopped performing live around 1980, and concentrated on writing stuff and learning how to record it. This process reached some sort of climax in the year 2000 when I released ‘Curly’s Airships’ on my own Masters Of Art label. The six years of writing and recording Curly left me pretty drained, and I dismantled my now completely obsolete studio, so I could have a bedroom, like normal people, and decided that, instead of doing more bloody music, I’d write a book instead. Two years and 150,000 words later, however, my friend and mentor Arthur Brown asked me to support him at a local gig that he was promoting. It’s not easy to turn down the God of Hellfire, so I found someone to play acoustic guitar for me, and once again came to grips with the grubby realities of The Cheap Gig. I scraped through the performance on good luck and adrenalin, and among the audience that night were a few guys who already liked my recorded work, and presumably thought it was worthwhile coming to see the extremely rare spectacle of me poncing about on stage. Over the next few months this group of music enthusiasts, who had first become aware my work through my connection with Van der Graaf Generator and Peter Hammill mounted a subtle campaign to persuade me to do more live performance. They were gentle, but they were firm. I was taken to various clubs where intelligent songwriters were performing interesting and literate music to appreciative audiences under the overall banner of ‘English Chanson’, a musical genre I had never heard of. I was persuaded to make a demo of the songs I could do live, and through their good offices as sort-of unofficial agents, I eventually notched up around four gigs at various venues of increasing size. Due to the familiar difficulties described at the start of this article, on each of these outings, I was supported by a different selection of musicians, so the lack of rehearsal, and the lack of anything resembling a regular ‘ensemble’ of adequate size, was a source of frustration. It has also proved to be an expensive hobby. What? Did I hear you say that you thought that the performer was supposed to make money from performing? Pardon me while I howl with laughter. Still, it was fun, and I started to write new material that would stand-up with just one guy strumming a guitar, or if I was very lucky, someone else playing a Keyboard of some kind. I had by now built a new, small, free-standing recording studio next to the house and kitted it out with a standard, computer-based digital recording outfit. 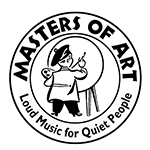 As a far-from-natural-born computer operator, the learning curve had been steep for me, but I had been able to work out what I was doing to the extent that, by Summer 2004, I had written and recorded an album of instrumental music for use by Massage Therapists. (My girlfriend Fiona is a professional Therapist who had pointed out the lack of music, of any quality, that is really suitable for massage.) However, before any attempt could be made to market this piece I was asked to record a CD of my ‘live act’ for a small label specializing in English Chanson. This seemed like a good opportunity, and I set to work at once. It was easy to decide that I should record in a semi-acoustic way, with a small number of instruments, so that the album would have some resemblance to what I had been doing live, but I spent a considerable time trying to find some new musicians who were based locally, with the rationale that recording (and gigging) would be easier, and cheaper, with musos conveniently on the doorstep. My search was unsuccessful; brilliant-but-unreliable, and dependable-but-not-very-good players came and went. One day, moaning about my problem on the phone to John Ellis, he reminded me politely that he would be delighted to play on another project of mine, and I accepted this change of plan with relief. As one of the two presiding instrumental geniuses of ‘Curly’s Airships’, John was already a wonderful interpreter of my work, and, of course, an old and close friend. He would play acoustic guitar and bass, and he suggested approaching Michael Ward-Bergeman to play Keyboards. I had already worked with Michael at an early gig of mine, and knew how skilled he was, and how agreeable to work with. Since then, John and Michael had got to know each other well, and were working on various joint projects together, so I would have the benefit of an existing rapport between musicians. Some of the songs I wanted to do would certainly benefit from having percussion of some kind, and at least two songs really needed drums. However, I was reluctant to start programming drum tracks, the way I had done for other records. 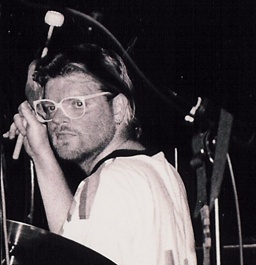 Having once been a drummer, no matter how poor, I know about rhythm, and I’ve become a good drum-programmer, but I was reluctant to go down this route. The album was supposed to be a live-sounding, natural sort of thing, even if the size of my studio, and the size of my budget, wouldn’t allow me to record everybody performing at the same time. My solution was to contact René van Commenée, the Dutch percussionist who had done such wonderful Tabla work on the Indian music sections of ‘Curly’s Airships’. He agreed to add some percussion where needed, and to try his hand at the drum kit, although it had been many years since he had played ‘normal’ drums. 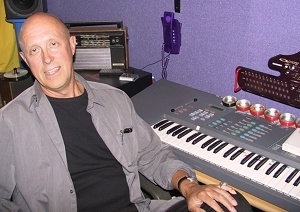 Recording began in earnest in the Autumn of 2004. I followed the same procedure that I used in ‘Curly’; recording simple synthesizer tracks to establish the tempo, the key and the musical structure of each song, and adding rough guide-vocals. These rough tracks are then replaced, one at a time, by real instruments (and real musicians). The final process in the recording procedure is to replace the rough vocals with finished ones. John visited me first, and recorded the bulk of his guitar and bass tracks. It’s always a delight to do music with John. His highly developed professional skills never seem to get in the way of his endless creativity. There is always a fresh and original musical idea for every point in the music; ideas I would never think of. He works fast, and I find my job during his sessions is mainly to make sure he has a fresh track to record to. My philosophy as a producer is to find the right musicians, point them in the direction you want to go, and then you just turn them loose and get out of the way! You get a much richer and more exciting result that way than you’ll ever reach by trying to force the music to conform to your own ideas. There are a hundred different and excellent ways to do any piece, and, particularly if it’s your own music, you have probably only thought of one of them. Only a week or so later, I got an e-mail from someone called Marco Olivotto in Italy who had read about my problem on an internet newsgroup (how does this information travel so fast?) and was offering to put the album out on his label, and even to mix it for me. Anyone can start a record label, but when I checked it out, I found that ‘Labour Of Love’ had a small but impressive looking catalogue, including a DVD of David Jackson, performing live in Italy, which I had already seen and admired. Marco seemed like a very nice chap from his e-mails, and the arrival of a selection of LoL albums which he had produced impressed me with the clarity and precision of their production. The contract he proposed was a model of fairness and simplicity, and to cap it all, he turned out to be a friend of David Lord, the genius producer who did so much to make ‘Curly’s Airships’ a success, and who confirmed that Marco knew what he was doing. 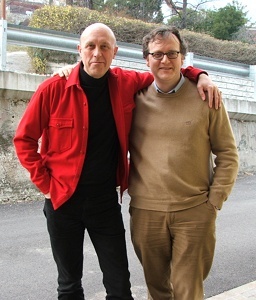 The deal was done, and I would travel to Rovereto in the Italian Alps to mix the finished album in March 2005. My next job was to get the drums and percussion recorded, and René and I agreed that it would be better if I could be there in person for the recording. However, in my world of No-Budget record making, even the modest expense of visiting Holland for a few days as René’s guest was not to be undertaken lightly. René came to the rescue, in his capacity as head of the Music Production and Jazz departments of the Rotterdam Conservatoire, and was able to secure for me a paid engagement to give a lecture to his Music Production students. The subject? ‘Recording major projects with no money’, and after doing ‘Curly’s Airships’, that’s something I’m a bit of an expert on. So I duly found myself in the impressive surroundings of this highly prestigious institution, pontificating to a dozen or so charming and sophisticated young Europeans about how you might be able to get musicians to play for you without being paid, but they won’t stick around long without being fed, and similar high-level stuff. I seemed to go down quite well, despite coming from a different planet from my audience, and, uniquely in my experience of academia, I was paid at once, and in cash. Long Live the Common Market. Back home, and with a deadline looming, it was time for the Keyboard parts to go on. Michael has his own digital studio at his home in Wimbledon, and having discussed every number with him in detail, I handed the whole thing over to him and went home to anxiously await the outcome. Michael is a wonderful musician, classically trained at Berklee College of Music in Boston, and with an extraordinary knowledge of different musical genres. From Boogie to Balkan, from Tippett to Tango, he can do the lot. 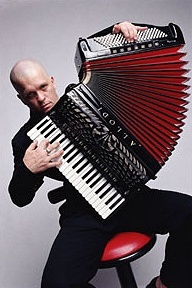 He’s equally at home on Piano or Organ, though his first love seems to be the Accordion, for which he has developed some unique techniques. Digital technology has transformed most aspects of life, but none more so than the creation of recorded music. René’s tracks and Michael’s tracks went to and fro between their studios and mine in the post, as computer files on CD-Rs. (They could have travelled even quicker by e-mail, but I still have only a dial-up connection to the internet, and music files are far too big for me to exchange that way.) And when it came to recording my finished vocals, my new studio computer proved to be far more efficient at capturing and editing my vocals than my old, analogue, reel-to-reel equipment had been. The way I approach this job is first to learn how to sing the song all the way through, but once I’ve got the shape and the drama right, and I know what vocal stylings (or annoying mannerisms, depending on your point of view) I want to use, and where I want to use them, then I’ll deal with each verse or section separately. I record about five versions of each bit, then pick the best phrases, or even words, from each version to compile the finished vocal for that segment of the song. You might think that this is a fragmented and inherently artificial way of singing a song, but the clever bit lies in making it sound completely natural, free flowing and un-contrived. It’s quite labour intensive, but it’s worth it as far as I’m concerned. The end result is just so much better than even the best of my single performances could ever be. Working like this, I can manage to complete the vocals of about one song a day, but on this occasion, my progress was halted because, like an idiot, I decided, in the middle of the proceedings, to sing the one song that had lots of screaming and shouting in it, instead of leaving it until last, with the result that I was croaking like Tom Waits for a few days, and couldn’t sing anything. The final bits of recording were only finished a day or so before I had to leave for Italy. I had no idea what the Labour Of Love studio would be like; everyone has their own studio these days. 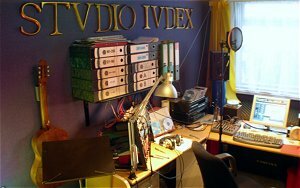 I’m very proud of my own Studio Judex, but it’s the same size as a single garage. Well, it is a single garage, in fact. However, Marco’s establishment is in a different league, a sizable modern building housing a fully professional studio with top-flight equipment, editing suites, offices and a permanent staff. It’s set in a village outside the historic town of Rovereto, surrounded by the snow-covered peaks of the Italian Alps. Breathtaking! My second surprise was the speed and efficiency with which Marco was able to work at his huge ProTools computer rig; on two occasions we mixed four songs a day, which is fast. Nevertheless, his painstaking approach and attention to detail were remarkable. He’s a calm and relaxing person to work with (as far from the national stereotype of the excitable Italian as you can imagine). Over the course of the week I was there, I became increasingly delighted, as my raw and sometimes minimally recorded multitracks were coaxed into giving up their secrets, and were magically transformed into the component parts of what I think is a fine-sounding CD that sets off my songs beautifully. Marco, and his wife and business partner Chiara, were the perfect hosts, and despite the intense work schedule, I had a great time there; Italy is a wonderful place. No sooner was everything mixed, than some large video cameras appeared to record an interview with me that would be added to the CD as an ‘extra’ (as far as I’m concerned, the scariest part of the entire project so far). 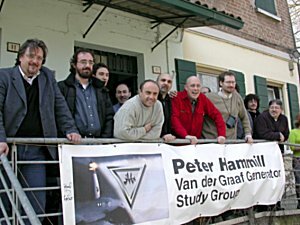 On my last full day in Italy, I was driven 120 km South to Guastalla to be the guest at a meeting of the legendary ‘Peter Hammill/VdGG Study Group’. This extraordinarily dedicated society of music enthusiasts, gave me an almost overwhelming welcome. I had to do an hour’s formal question-and-answer session (fortunately with Marco acting as interpreter) and signed innumerable old albums that I really had hardly anything to do with. I also was able to sell a considerable quantity of ‘Curly’s Airships’ and ‘Dome Of Discovery’, which was very gratifying. The evening ended with a magnificent banquet (there is no other word) which suddenly materialised out of nowhere. It was quite a party! The guiding light of the Study Group, the remarkable Dr Emelio Maestri, and his partner Marina, looked after me royally at both ends of my visit; meeting me at the airport and driving me to the studio, when I arrived, and seeing me safely on the plane for home. 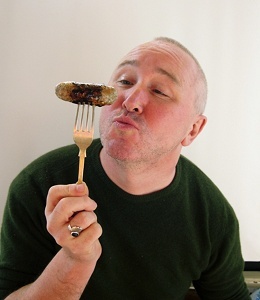 Now, as I prepare for the London gig that will launch the CD, I feel that ‘The Full English’ project has been six months of my life well spent. I made new music with new friends, and who could ask for anything better? If anyone else actually enjoys it, then that will just be one extra blessing for me to count.